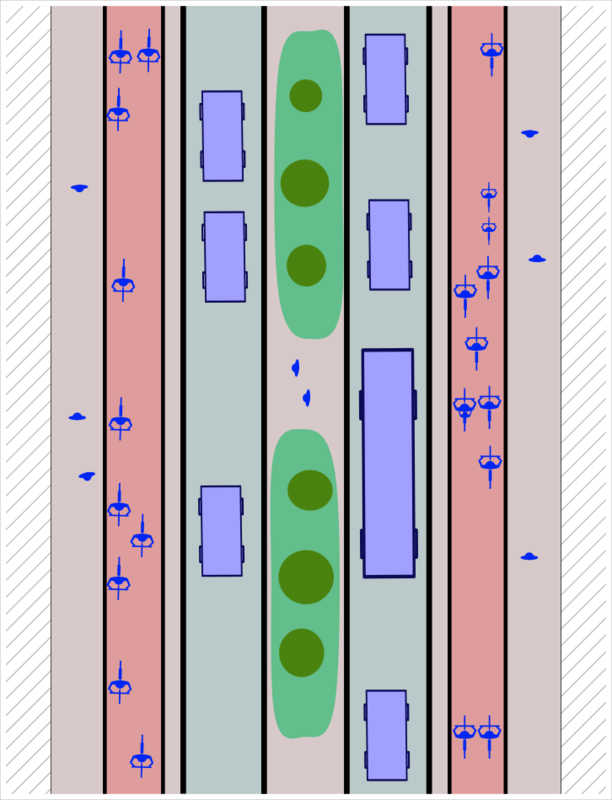 This is part 1 (basic cycle track anatomy). These images are not to scale, and almost certainly contain errors when compared to real infrastructure. Inevitably actual infrastructure varies hugely in reality too. What I’m drawing here is simply an idealised image, intended to convey the differences in general approach which I’ve observed during my visits. I highly recommend – for those who don’t know them – spending some time ‘browsing’ the cities of the Netherlands, and Copenhagen using Google Streetview. I’ve included initial links to show locations most closely matching the images I’ve drawn. If you live in one of these countries and can provide further information then please do use the comments to do so. If necessary I will also update the article as additional information is provided. NB: For small screens, the images and text may work best with your device held in landscape orientation. This is a UK road where some very basic attempts have been made to support cycling. There are ‘advisory’ cycle lanes. The purpose of these is unclear – as they (often) achieve very little. They may even be so narrow as to make it impossible to paint a bicycle symbol in the lane. Such narrow lanes encourage people to cycle on broken road surface, into drains and other obstacles, and to take the most dangerous road position. They also encourage those driving to pass, when they wouldn’t normally. 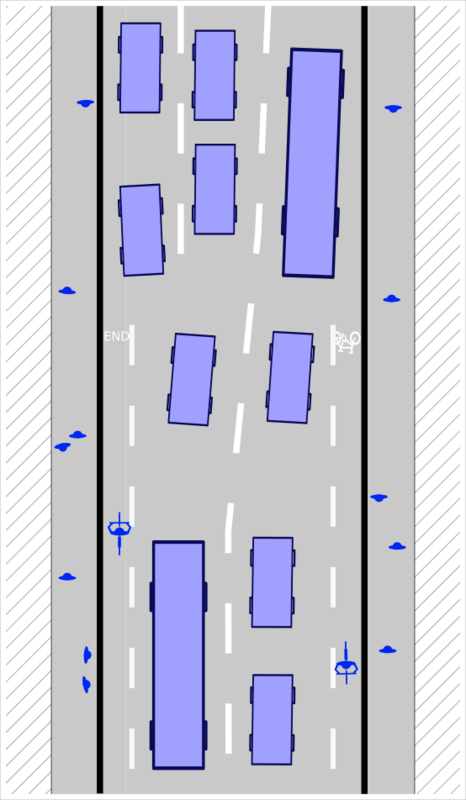 In the image you can see that cars are parked in these lanes. 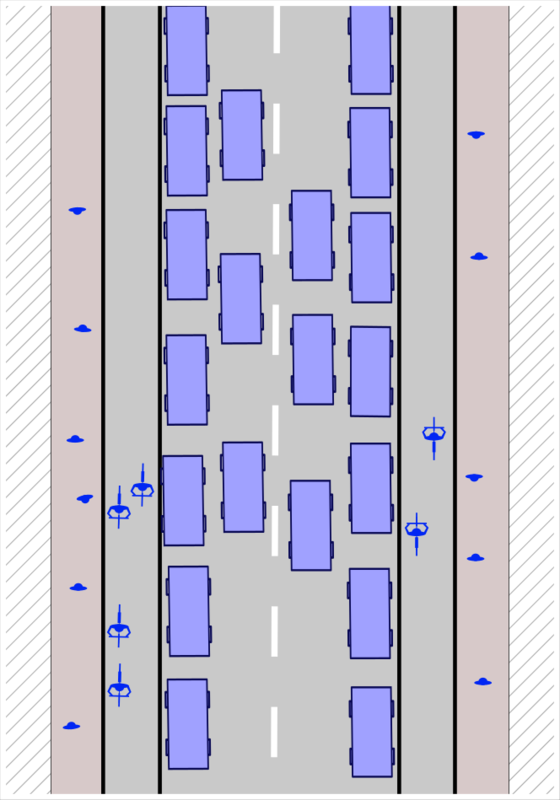 A Copenhagen / Danish equivalent – a relatively standard treatment for a road like this would be as shown. Cycling has been prioritised over parking. There’s no space for parking. Cycle tracks have been added. These are slightly raised from the road, and slightly lower than the footway. Note that I’m using the term ‘footway’ for clarity, to refer to what we’d call ‘pavement’ in the UK, to distinguish this from the word ‘pavement’ as used to describe the surfacing material. The tracks are immediately between road and footway. They have the same surfacing as the road. 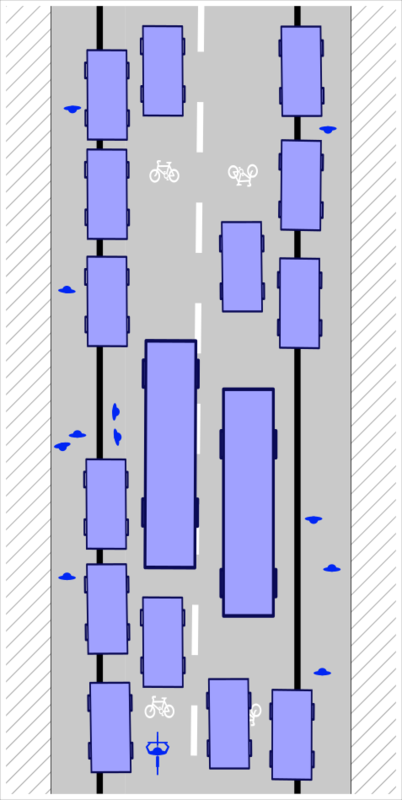 They can be used in one direction only – cycling is on the right of the road, as with other traffic. Typically a street in the Netherlands which is too narrow to allow for safe passage of those on foot, cycling, and driving – where there is significant use by bike and on foot – will see walking and cycling prioritised. Quite likely this will mean some degree of pedestrianisation – as shown in this image (which looks less exciting because all the lanes have gone – leaving just people). Other more unique solutions might be considered too. Perhaps, as in the second image, one-way traffic would be allowed, maybe being limited to public transport. Typically cycle tracks in the Netherlands are set slightly below the footway with forgiving angled kerbs. 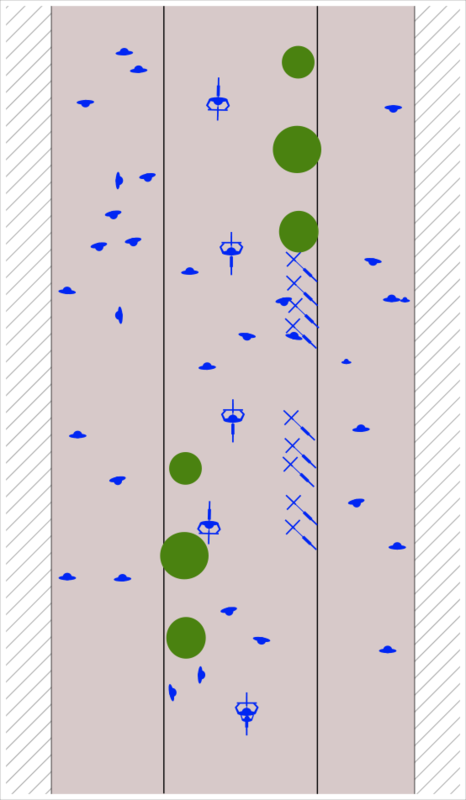 Each track is for one-way cycling – cycling is on the right of the road. There is also a buffer space between the cycle track and the road – used for bicycle parking, plant life (3 small trees in this image), or simply as a buffer. The cycle tracks are often of a distinctive red material used throughout the Netherlands to indicate cycling infrastructure. In reality situations exactly as described here are rare – and what I’m trying to capture is some idea of the approach to priorities. The streetview images below capture some locations where this kind of thinking is evident – although they don’t match the actual image. There is space in this street to allow parking, and wide lanes for traffic flow. Traffic travels quickly because of the wide lanes. The speed limit is 30mph/48kph but traffic often reaches 40mph/64kph. In an attempt to support cycling the footway on this street has been ‘redetermined’ such that cycling on it is legal. Cycling is allowed on either footway in both directions. In future the footways may be widened a little. Most people who are cycling choose to remain on the road for obvious reasons. This street is wide enough to allow vehicle movement, parking, and cycle tracks. 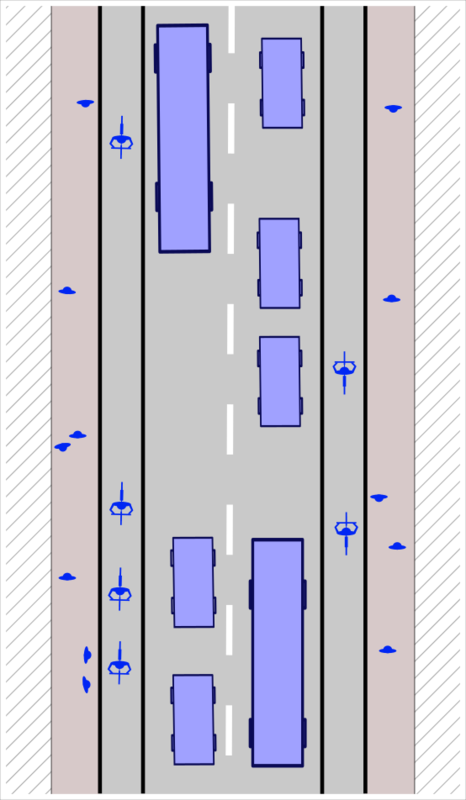 The cycle tracks are uni-directional – cycling is in one direction on a track, and as with the motor traffic is on the right of the road. There is some risk to those cycling from car doors being opened into the cycle track – but the tracks are wide enough such that those cycling to the right of the track are clear of an opened door. On the whole traffic speeds are limited by the road configuration. 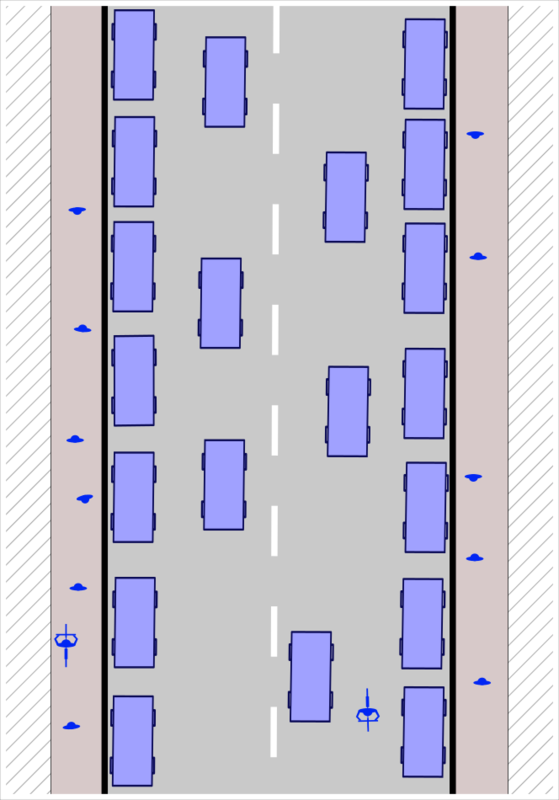 A physical buffer between the cycle track and parked vehicles is regarded as important so the carriageway space is narrowed, with parking restricted. There is no risk to those cycling from opened car doors. 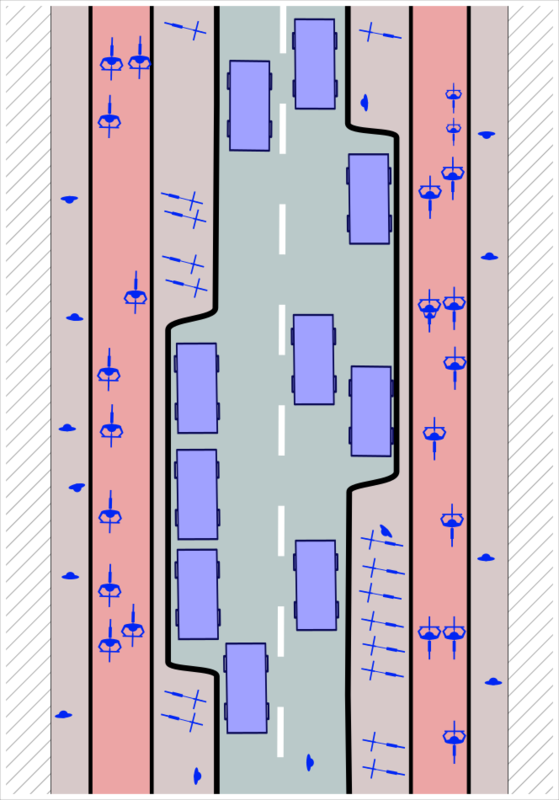 Cycle tracks are set below the surrounding footway, are uni-directional, and are surfaced with the distinctive red material used throughout the Netherlands. The additional footway space, lower traffic volume, and lower traffic speed, makes the road much easier to cross than an equivalent in the UK. This road is wide enough to support four lanes, with a divider in the middle of the road. There may also be a barrier restricting the ability of people to cross the road. The speed limit is 40mph/64kmh, but when congestion eases people often travel at up to 50mph/80kph. In this case the footways have been ‘redetermined’ in order that cycling is legal here – but pedestrian numbers are often small and it wouldn’t be unusual to find that those few people cycling might resort to use of the footway anyway. 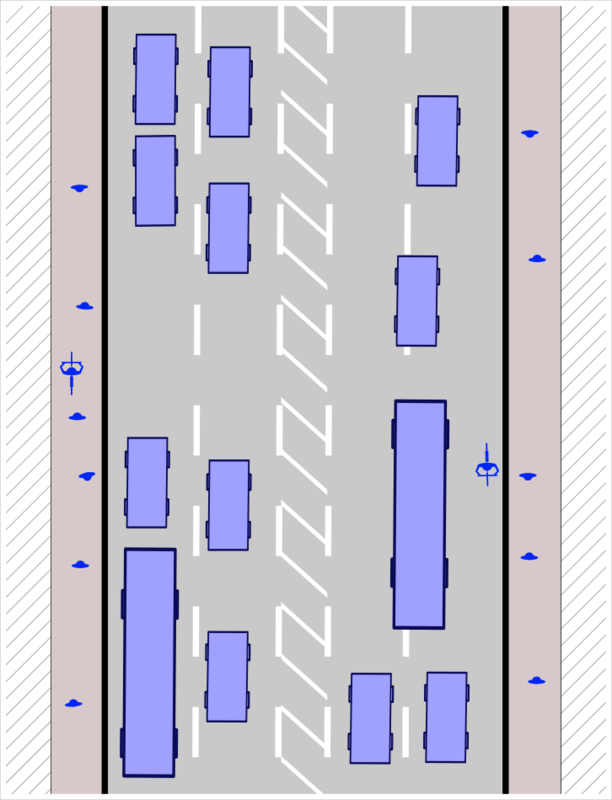 This is an important through-route for motor traffic, so parking is restricted and 4 vehicle lanes are provided. 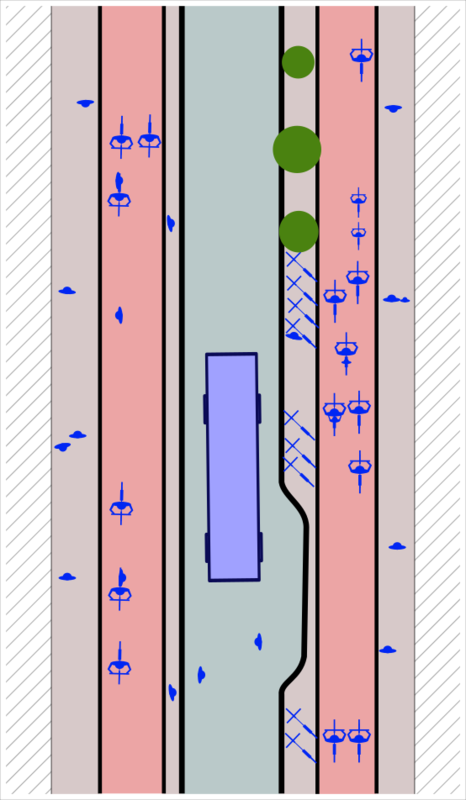 Cycle tracks are provided using the standard design discussed above. As always these are uni-directional. Because this is an inner-city road, and cycling and walking are to be prioritised, steps have been taken to restrict the speed and volume of motor traffic. Where the road previously had four lanes of motor traffic there are now only two. These are not consistently straight, and there is a significant amount of greenery on the street. This may be in the middle, or at the sides. If the street is wide enough it may be a section of actual park which is in the middle of the street. There are some important images missing from those above. I’d like to provide an image to adequately demonstrate the treatment of narrower residential streets – or even wider residential streets. Unfortunately the key design features are difficult to illustrate with this approach. These streets are as important, if not more important, for cycling and walking as those streets with obvious cycleways. From above, in short sections as I’ve drawn here, they would often look relatively similar to streets in the UK. The key difference is that they carry tiny amounts of motor-vehicle movement because the one-way systems are designed to prevent use for anything other than access. Access to the streets will have been by crossing a gateway feature – making it clear that this is a quiet residential street. The carriageway will be narrow. Parking is also controlled, road space restricted, and very low speeds result. Narrow residential UK streets, overwhelmed by vehicles. What I can draw – as here – is what these narrow streets look like in the UK. Typically both parking and traffic flow are prioritised over anything else. Sometimes these streets are regarded as suitable for cycling. 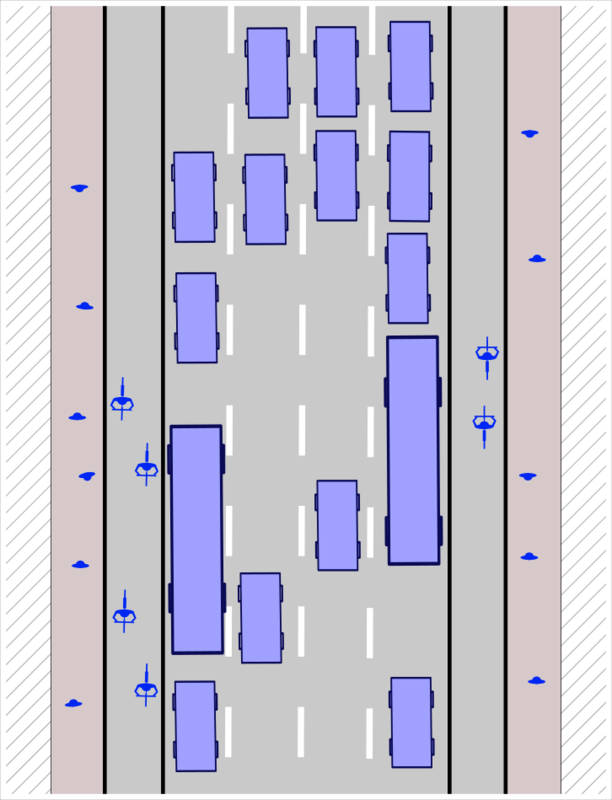 In this case, because it is perceived that there is no space for dedicated infrastructure, images of bicycles are painted on the road surface instead. Parking on the footway is allowed, or even actively encouraged. Narrower residential Netherlands streets, with human life prioritised. Not all of the Netherlands residential streets look quite as good as this, but such treatments are common. 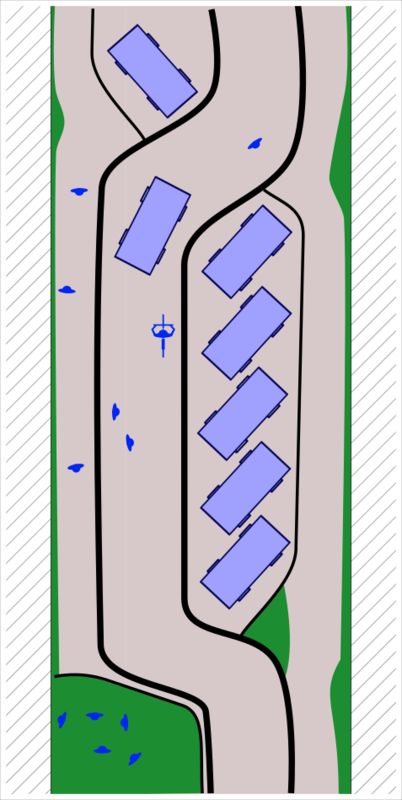 In addition to the treatments described above, in this example – which may be signed as a ‘home zone’ the carriageway is further narrowed. This will be a one way street, with two way cycling. It’s not a suburban street, but one within the main part of the city. Housing is dense here, so there’s lots of human life. The greenery isn’t a scrubby tree or two, but something much less restrained. The street will include play equipment. There will be bollards, or fences, or strategically positioned trees meaning that car movement has to be slow. Importantly the street will not feel like a car park – but an urban space for people where some car parking is squeezed in. This is not at the back of the housing – but is overlooked. The buildings focus onto this space, not away from it. This is where children will be playing. There are occasional attempts to copy this kind of treatment in the UK – but what’s easy to miss is the detail here… the combination of factors that make the street successful. In the images at the top of this post I’ve shown a UK advisory cycle lane overwhelmed by parked vehicles, and then later the common practice of ‘re-determining’ footway so that cycling is allowed. While I was drawing pretty pictures I couldn’t resist capturing the character of some of the other alternative treatments of infrastructure in the UK… treatments provided with the supposed aim of supporting cycling. So here, for your entertainment, we have the “so narrow as to be utterly useless everywhere and gives up when it gets difficult” style of advisory cycle lane. Then finally we have the “ridiculous and utterly unusable painted on random bits of footway” style of infrastructure. Note that the paint has faded in parts and while this section still appears on maps it’s not actually used by anyone (and never was). I have the beginnings of something written for part 3 of a series – trying to comment on the overall results of the different designs. I want to get part 2 up first though – about junction design. No worries. Part 2 is published in case you hadn’t noticed. “In the image you can see that cars are parked in these lanes.” : you mean illegally parked, don’t you ? 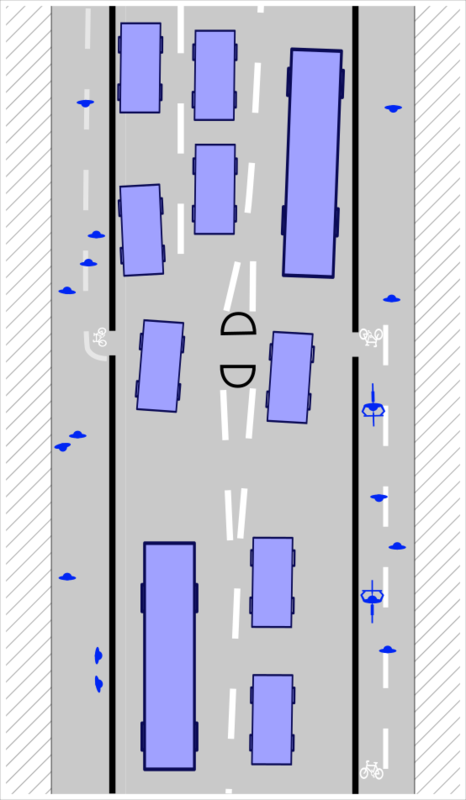 Actually if these are UK ‘advisory’ cycle lanes (as I’ve drawn them) then the parking is probably legal. Often the reasoning is that they are better than nothing – supporting cycling during times when parking isn’t allowed… or at least in sections where nobody is parked. I disagree profoundly. Normally the narrowness itself is the biggest problem – beyond the parking – with lanes like this actively encouraging people to pass too closely, and actively encouraging people to cycle in the gutter. In my view 90% of these lanes in the UK are actually WORSE than a waste of white paint – not only failing to improve things but being actively dangerous. Thanks for a very well set out comparison. Looking forward to part 2. There is greater pressure for wider and longer parking bays in the UK, to reflect the growing size of cars, and I assume therefore, that reducing the width of the running lanes would be difficult to achieve. Plus our refuse vehicles seem to get larger and larger. Are these issues in DK/NL and if so, how are they being addressed? Underground refuse collection probably helps, but is really only happening at the NW Cambridge development which is dense, and owned by Cambridge University so they have a long term land interest. Not viable in the past at other sites in the same city. The point is of course that both the Netherlands and Denmark faced these same issues. But there they decided that what is most important is the liveability of their towns and cities (particularly the Netherlands). In the UK ‘the system’ has decided that this isn’t important enough to warrant the changes we’d need. And by saying the ‘system’ I’m intentionally not blaming any one person or group by the way… it would be easy to blame ‘the politicians’ or ‘the government’ but change is complex… (see other articles for more on this). There seems to be a little too much of the redetermined footway (or shared use pavement) on here. In the UK I would say such facilities are relatively rare. Just enough of them to undermine the insistence on a pavement cycling ban elsewhere. Obviously the best way to get bikes off the footway is to provide the owners with better options. I love the article in general though, and the pictures. A great overview of the different approaches. Also, it makes it very clear how wedded the UK is to free on-street parking everywhere, and how we suffer from that reliance. Even just one car parked at a roadside or in a painted cycle lane reduces visibility for everyone, and forces cyclists into the path of potentially fast moving motor vehicles. Very interesting. The pictures might be slightly clearer if the parked cars a different colour/shade. Great work. In UK the ‘Residential Roads Guidance’ has evolved from the (in my terms) dreadful DB32 (1977-2007). The replacement, Manual(s) for Streets ‘withdrew’ the former advice but it seems to me that hardly anything has changed. And some Highway Authorities (Oxfordshire) still cling to DB32 and in a 2015 ‘Preamble’ Oxon tried to explain why. Barely covering the prejudice of its position. So Distributor Roads with back fences and dangerous, for cycling, roundabouts proliferate still. But a greater conceptual issue for me, and parts of Oxford City and any older place, is how to deal with roads which are busy, relatively narrow, and where the Hierarchy of Provisions is a dead duck. In this context there’s an interesting case in NL. Utrecht is struggling with Burgemeester Regierstraat, where a new ‘median and tight shared lanes’ design was found unacceptable in the 90s. It was replaced with a ‘cycle lanes + a too narrow for two vehicles to pass’ design. The city is now consulting on another, different Design approach but nothing public yet. These ‘busy with traffic and businesses, narrow and mostly undivertable traffic’ are common enough. There’s half a dozen at least in Oxford City centre. Actually I know Burgemeester Reigerstraat now I think about it. Yes, clearly not the best part of that street – but still a million miles ahead of the UK. Very interesting, thanks. I grew up in Germany, but live now in the Netherlands and can basically confirm your view of the Dutch cycle infrastructure. I could add that the German cycle ways on streets unfortunately resemble much more the UK style than the Dutch style. Often there aren‘t even any bike symbols on the streets. In the Netherlands, on the other hand, you‘d be hard pressed to find a steet without a cycle path nearby. Thanks. Although it might appear that I’m only interested in development in the UK of course there are many places which are similar… although the UK seems to be particularly far behind. Perhaps this makes it a good choice to compare to the Netherlands and Denmark. The Berlin infrastructure didn’t impress me, but one of my kids spent a week with a family in Munich and he tells me that the cycling was quite good and much better then Berlin (at least where he was staying). 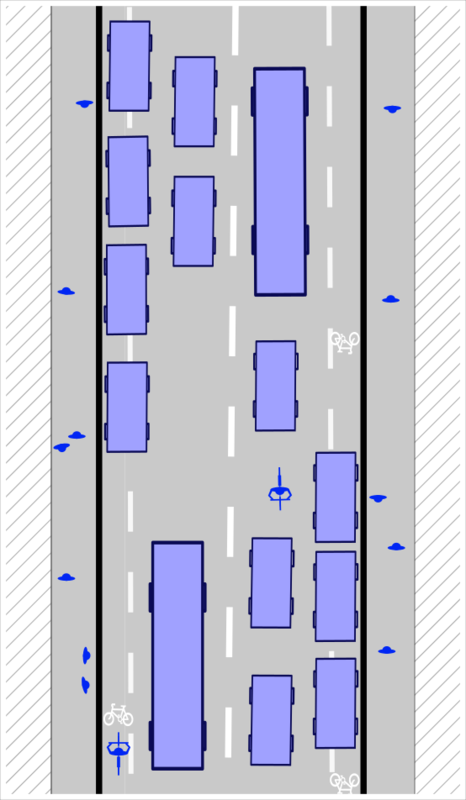 What may be beneficial is to indicate approximate level of traffic flow (cycles / peds / motor vehicles) that each situation can accomodate in a typical hour. Both for comparison purposes but also to highlight why these different types of street exist. My point is that – as far as I can see – the Netherlands has rejected traffic flow as a starting point – whereas the rest of the world (yes even Denmark) hasn’t yet. In the Netherlands they are trying to ask “what do we need to do so that this city is habitable – and within what that allows what motor traffic can we allow”. Everyone else asks “what motor traffic do we have (what capacity do we need) and how might it grow – and within this what can we do to allow walking and cycling”. The approaches are fundamentally different – and create utterly different results. So approximate flow per hour is simply the wrong starting point. Traffic flows in urban areas aren’t low because the Dutch are somehow nice people, less lazy, more community minded. It’s not because it’s flat. It’s not because in the Netherlands the weather is different from everywhere else on the planet. They aren’t low because people choose bicycles in a free and open way. Traffic flows are low because it is made difficult to drive and easy to walk and cycle – leading to a situation where what you want to get to is close at hand – leading to a situation where it’s easier to walk and cycle to the destination than to drive – and so on. So while we need to know about traffic flow actually it’s really not at all interesting in terms of policy level decisions – and specifically it’s not ‘why these different types of street exist’. I think the main difference is that The Netherlands sees cycling as (an important type of) traffic, too, so instead of talking about CAR traffic flow, the starting point is people throughput. By giving cycling the space and priority it needs, that goal is quite easily achieved since cycling is so much more space-efficient than driving. Although I think people will probably understand what I intended.